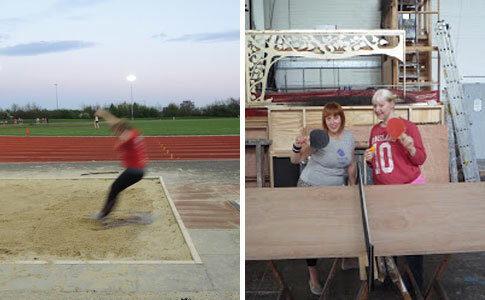 Home > Features > Events week: Sarah and Ellie do the Olympics! Events week: Sarah and Ellie do the Olympics! We love a good sporting story. 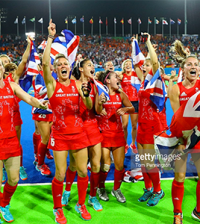 The most challenging and surprising ones are our favourite, and ever since London 2012 we’ve been inundated with people telling us some fantastic and unbelievable tales of how the Games have truly inspired them. Whether it be to train harder, to take on a new sport or discover new challenges it seems a huge number of us are now being more active. But there are two girls in particular, Sarah and Ellie, and their story that we thought would be fantastic to share with you for our special events week. Not being hugely sporty individuals the two friends were amazed at how in love they fell with the Games last year. For them it wasn’t just about getting behind Team GB, but also about learning and watching sports they had previously known nothing about. And so it was just before the Paralympics that Sarah and Ellie decided to set themselves a little challenge; to try something new. Sounds fair enough, but it didn’t stop at just one sport, the two girls decided to take on the task of trying every women’s event that is held at an Olympic Games before Rio 2016. Ellie, this task sounds amazing, how are you both getting on with it? I know, its a little mad though! We’ve only done 16 out of 114 events so far! Not really. I like cricket I used to work at Essex County Cricket Club and Sarah has done a few runs, so I suppose we were kind of moderately sporty, but not to any massive degree, neither of us were in teams or anything. We just had a weird conversation after being addicted to watching the Olympics and decided that we would try all the women’s events from London 2012 and do them before Rio 2016. 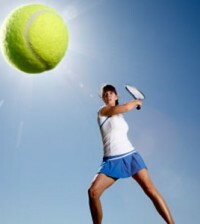 How have you gone about trying to find and participate in the new sports? We’ve just been contacting as many people as we can find on either Google, Facebook or Twitter and from there is has just kind of spiralled out of control! We haven’t been approached too much yet, but each time we’ve done a new event or gone to a new club they will be like ‘Oh do you need to do this? We know that person who can help,’ so people have been really encouraging and pushing us in the right direction which is great. It must take up a lot of time, do you both work? Yes we both work full time. I work for a theatre company front of house and Sarah works for a stroke charity, but we’ve both said so many times that you can easily do this as a full time job! So what events have you done so far? Since September we have done quite a few main ones that are fairly accessible, so for example we’ve done tennis and table tennis and badminton. We have also been involved with Southend Athletics Club and we have done discus, hammer, shotput and javelin which I have no idea why they let people like us do! It was a great experience though, they were professional and friendly and we got a proper fountain pen score card at the end! 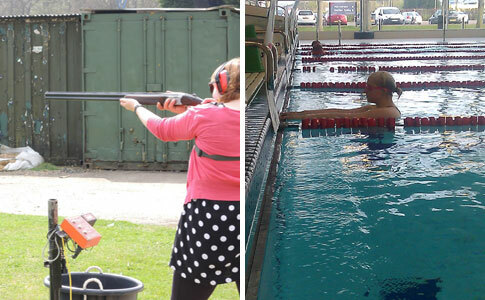 We’ve also been practicing basketball and volleyball this year and we’ve also done some swimming. How many sports are there in total you have to do? So far we’ve done 16 events and we have 114 to do in total. We’re doing the events not sports. There are between 30-40 sports, but for example for athletics there are a lot of events included, so its broken down into a higher number of things to do. And how often are you able to try something new? It all depends on who we’ve met and how accessible it is for us. For swimming we had two months of lessons and now we’ve been left to our own devices. 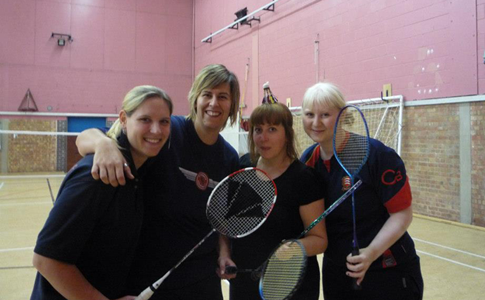 With the volleyball we’ve been going every Tuesday for the last couple of months in Essex for lessons. And we’re hoping to take part in a competition soon which will actually have the right rules for the Olympics. Some things we haven’t had any lessons like throwing and jumping, we just go along for a session and join in for a few minutes with everyone else who is taking part. How difficult has it been to find the sports? Have you had to travel far? We live in Colchester, and one of the things we thought about was how easy is it to do it where you live. As far as possible we just try and do it in Essex to prove the point that any sport you want to do its accessible, it’s in your back garden. And we’ve found that actually many sports are available really close to where we live, like shooting we had no idea, but a bit of Googling and we found it close by. How is your challenge funded? We cover our own expenses. The whole thing is self-funded and so far its been fairly inexpensive, apart from petrol, so its pretty achievable. And things like equipment or kit, so far people have provided that for us, basically we just bring ourselves and a camera. We did buy new trainers to begin with, but that’s about it. Which events have you so far enjoyed the most? We haven’t not enjoyed any of them to be honest. Maybe trampolining because that is always a huge amount of fun, whatever level you are. 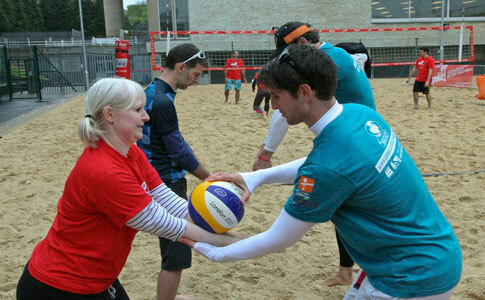 And volleyball – the people who we’ve met through volleyball have been the most enthusiastic, fun and welcoming people. I seem to have the ability to hit the ball at people on my team in volleyball, which is not the best, but I enjoy it. Today at the launch of Go Spike’s Big Weekend, the weather was bad and it’s a little intimidating playing with members from Team GB, but its so much fun and when you hit the ball right its great. We’re definitely going to try to go to Go Spike’s Big Weekend on 25 May. So what sports are next for you? So we’ve got 98 events left over three years! Next is a basketball day at the end of June, and we’re going to keep at volleyball so we can eventually enter a competition. We keep forgetting some will be difficult to do, some sports you can knock off quite quickly like tennis and swimming, but sports like horse riding and sailing we think will be much harder to take time out for and take part in. We feel pretty on track at the moment. As long as by the end of this year we’ve done about 30 we won’t feel too panicked that we can’t complete it in time. What are you going to do at the end of it all? At the end we are never going to do anything like this again! I think it has the potential to be very tiring. 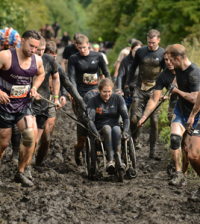 Event: Tough Mudder…in a wheelchair? 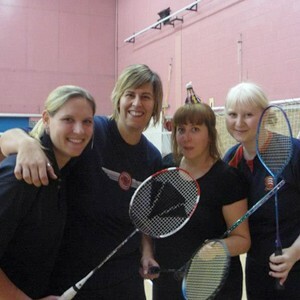 Have Your Say: Is it time women played five sets?